With the release of our 18th exhibition we sat down with the very intellectual Rob Shields to discuss his inspirations and contributions to the collective. Congratulations on being our featured artist for Exhibition 18, Rob! Please tell us a little bit about yourself and how you ended up joining slashTHREE. I am a freelance illustrator currently living in Philadelphia. I hold degrees in Psychology, Philosophy and have done some post-graduate work in Media and Communication. I launched my website in 2008 and have worked fulltime freelance ever since. My involvement with Slashthree began in 2010 when I applied after seeing the 14th exhibition Le Cirque Des Couleurs. Its a real honor to be part of such an accomplished group of artists. Its not typical that you find a digital artist with degrees in psychology and philosophy; how did your choice to pursue these two degrees factor into your decision to become an artist? It was a terrible hindrance actually. I think if anything the US education system encouraged me not to be an artist. Luckily I didn't listen to it and so I got to follow my dream instead of ending up as some rich successful businessman with a model for a wife and summerhouses in three different countries. A problem with digital art today seems to be a lack of thought and concept, based on this, how do you feel about the role of education in art? Well I don't think anyone would deny the importance of education. However, critical thinking is even more important than education, it can only be practiced not taught. There's no guarantee that smarter people will create more compelling art. Its more about being honest with yourself about your art and what you're trying to accomplish with it. 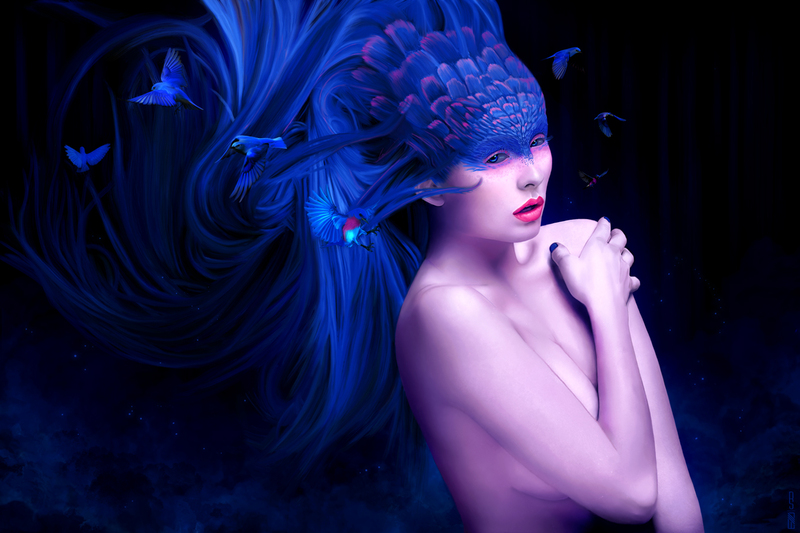 What role do you think a traditional artistic experience plays in the creation of digital art? Have you worked traditionally before? Its actually really easy to recognize digital art created by someone who trains traditionally. For me traditional practice is worlds ahead of anything Photoshop could ever offer. Don't get me wrong; I love Photoshop and it is my window to the digital world but it just doesn't compare to real life. Tell us about Maleficent and Jorinde and Joringel, the two Fairy Tales you illustrated for the exhibition, do they hold any personal significance to you? Its hard to say; they are both pretty diverse. One is a villain, one is a victim but I side with both of them. They are also both shape-shifters, which I can definitely relate to. Change is probably the corner stone of my own personal philosophy. In a much more real sense though they are both characters that have deformity. Its a beautiful deformity though, one that I imagine each character embracing. Many of your previous Slashthree submissions have had their subject matter focused around the female form; can you elaborate on your choice to often use females as focal points? I think that women as an image are more diverse and powerful than men as an image. A man is supposed to be powerful; that is sort of his whole trick, the pretense of power. Women on the other hand don't have this pretense so any power that they acquire is earned and thus more visceral. Likewise vulnerability and emotion, two universal aspects of the human condition, are more readily embraced in images of women whereas they are denounced in images of men. Which of your two submissions to Fairy Tales was your personal favorite? I would have to say Maleficent is my favorite even though I completed it before Virgin of the Birds. Usually my latest piece is my favorite. Maleficent is much darker which is something that I tend to respond well to. I like that there is something sinister about the character but that she is also alluring. Its also a bit of a breakthrough piece for me in terms of the level of quality I was able to achieve. Briefly walk us through the conceptualization and production of the piece Maleficent. The piece is based (with permission) on an image created by the fashion photographer Chen Man. I was very much attracted to the way the light and shadow interacted with the models face and so I decided to make it into a painting. I chose a darker color palette to set the mood of the piece and then began blocking the shapes. I knew from the beginning that I wanted the dual horns so I just roughly sketched those over the silhouette at the start. I then experimented with a few simple backgrounds to get something I liked. From there it was all about refinement until the final image. What sort of people do you often draw inspiration from? 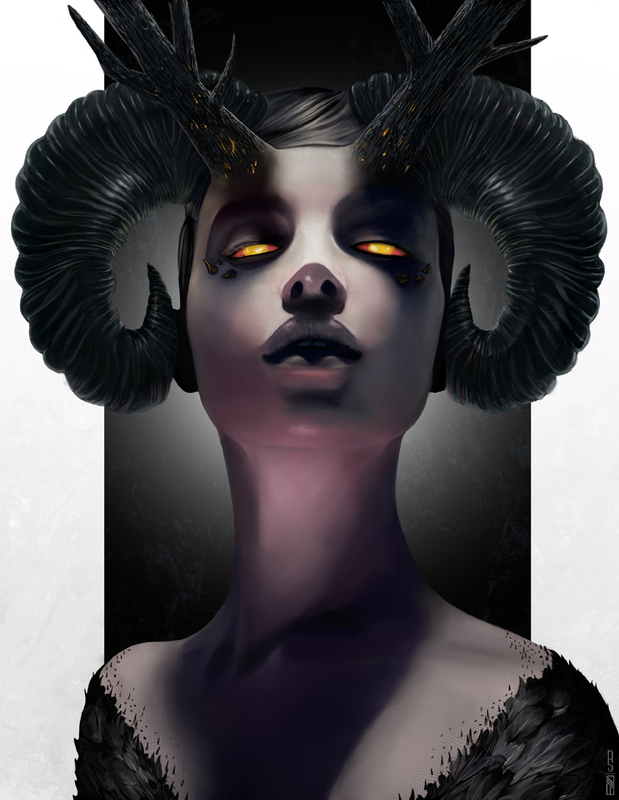 I am most inspired by Jeff Simpson, Jace Wallace, Bao Pham, Ryohei Hase, and Stanley Lau to name a few. I try not to draw too much inspiration from any one source as I think it stifles creativity. Who among the Slashthree core do you feel most appropriately captured the magic behind the Fairy Tale theme? 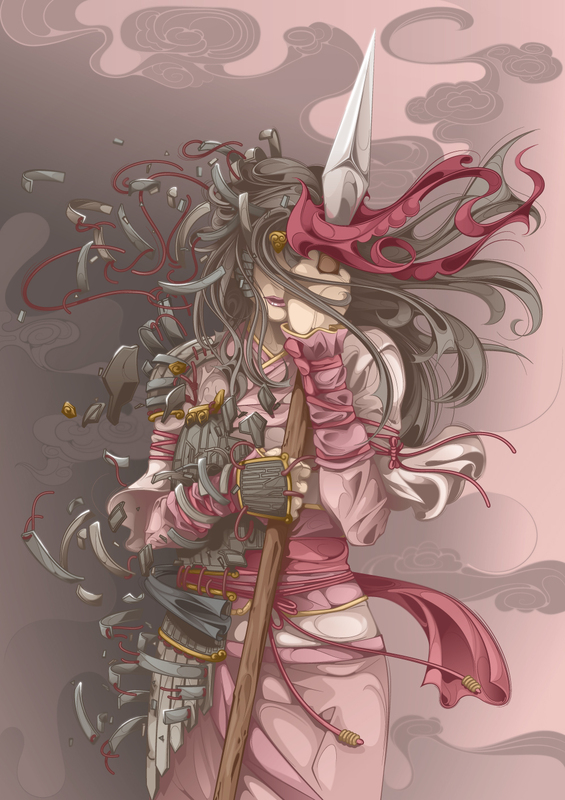 I really like Man-Tsun's interpretation of Mulan. So much of what that story means is incorporated into the image. Its also a very kinetic piece of work that I can easily imagine animated. Of course it's also an image of a female warrior so its little surprise that I would pick it. How do you feel about the two pieces you submitted to Fairy Tales in comparison to some of your personal and commercial projects? Did working under such a visually broad theme help you to produce something above your normal standard? I actually think that working under a theme is better not because it broadens your possibilities but because it limits them. It gives you a solid direction in an otherwise aimless sea of possibilities. The two pieces I created for fairy tales definitely represent an increase in standard for me. In that sense I am much more excited by them than some of my other work. They just seem more full of potential. Are you working on any commercial projects currently that mimic the 'solid creative direction' you found while creating work for Fairy Tales? Its funny because I am getting a lot more high profile client work but its for my photo manipulation style because that is already established. I still consider myself to be new to digital painting so I think it will take some time and a wider selection of images before that aspect of what I do becomes marketable. People don't want to take chances on a style you might be good at. They need to know that you can produce at that level consistently. Thanks for taking the time to chat with us Rob, do you have any last words? Thanks for interviewing me; its an honor to have been selected.